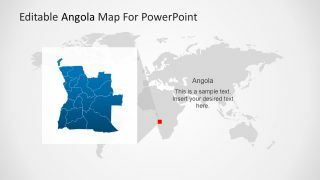 The Editable Angola PowerPoint Map is a flat geographical map layout of African country. 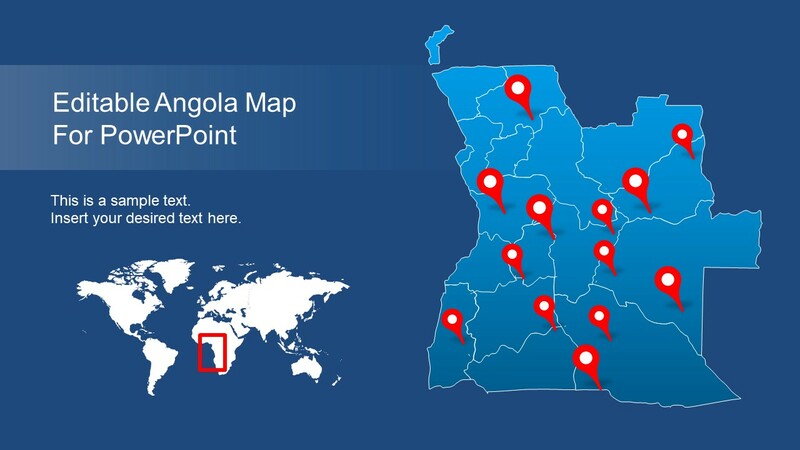 Angola is situated in South-Central Africa as 7th largest country in continent. The SlideModel catalog contains several other African county maps including a map of Africa continent. 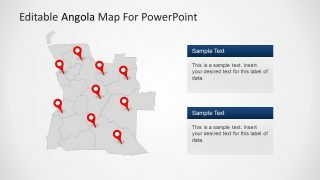 There are 9 slides with a variety of layout designs using same editable Angola PowerPoint map. 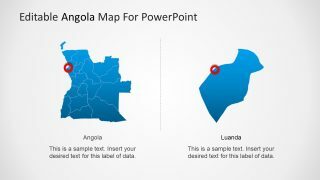 And map itself is a collection of high-quality vector shapes depicting 18 provinces of Angola. 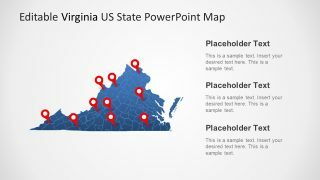 Therefore, resizing these shapes does not affect the quality of graphics in PowerPoint. Each individual segment is a provincial editable shape. 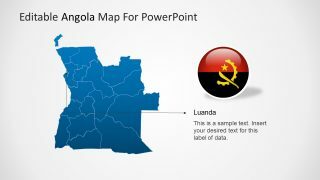 This template not only presents a silhouette map of Angola, but it also contains an editable world map. Hence, users can highlight Angola as a part of the world and then county of Africa. The details in designs and patterns of all 9 slides show clean layouts for professional and personal use. 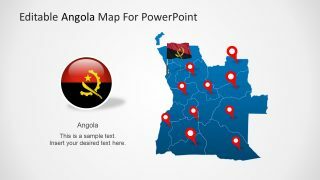 This outline map of Angola also contains flags and location pin clipart icons. These additional shapes assist in highlighting special areas of map. Similarly, the flag icon including badge and pole style is helpful while delivering a speech on international platforms. 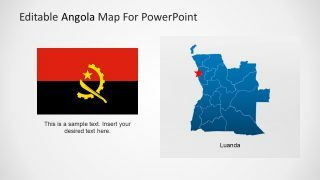 Or just use it for educating geography students to learn more about Angola region. 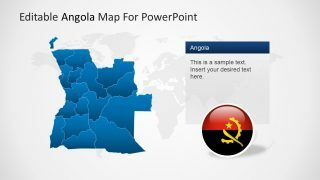 The Editable Angola PowerPoint Map displays blue and gray map silhouette slides. But users can add different colors into individual segments and enhance visibility. 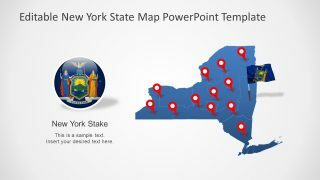 Few slides have earth map background. The text placeholders enable users to add detailed textual information about their topics. 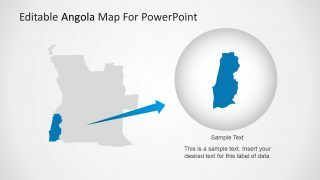 For example, the two text placeholders and map slide for pros and cons opening a business franchise in Angola. 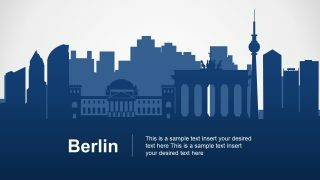 Similarly, use location pins and title bars to highlight some tourist spots. 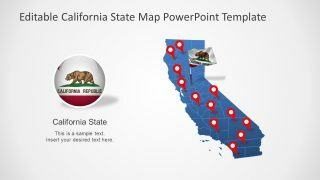 Or, zoom-in to a province by resizing shape for history lessons.